Paid on arrival, bed linen avail at £6 per double & £3 per single per week & towels avail at £2 per person per week. 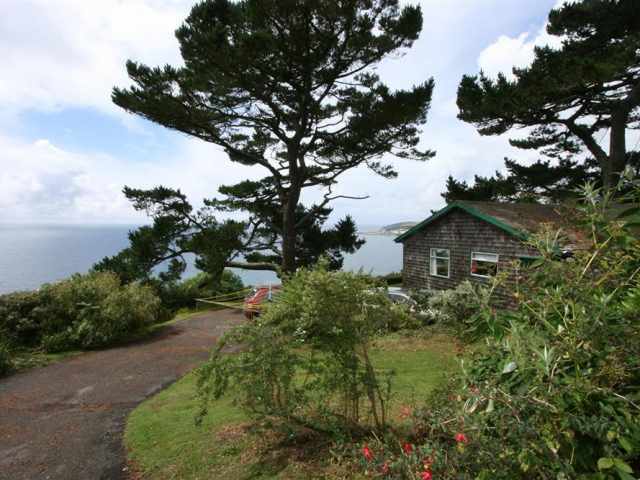 With superb uninterrupted coastal views along the cliffs of Looe Bay and out to sea beyond Looe Island this comfortable, older style detached bungalow is set in a lovely cliff top garden. Approached from a lane by a gated tarmac drive that slopes steeply down through the garden, the property is fronted by a lawn, part shaded by trees. Looe to the west with its shops, pubs, restaurants, fishing trips and boat hire is 3.5 miles by road but can be reached by footpath 1.5 miles away and the picturesque harbourside village of Polperro is about 8 miles. There are small stores at Nomansland and Downderry open all year, the latter has beaches and is 2 miles. There are several gardens and houses within easy reach including the Eden Project, Lost Gardens of Heligan, Lanhydrock and Mount Edgcumbe. Four railed steps lead up from the parking area to the front door which opens into a small hallway. On the seaward side and with lovely sea views are a smartly fitted kitchen dining room and an adjacent light and spacious sitting room with double glazed patio doors which open to a new timber railed decking. At one end of the deck, four steps lead down to the front lawn with glorious sea views. There are two bedrooms with a double and twin beds respectively and a bathroom W.C. with hand basin, bath and shower cubicle completes the accommodation. The property is heated by modern electric radiators. The garden is fenced and hedged but not totally pet or toddler proof and there is a garden shed for the storage of beach gear etc.